Sen. Elizabeth Warren has emerged as the Democratic Party's "candidate-of-the-moment" for the 2020 presidential elections, writes Rebecca Traister in NYMag. Why it matters: With frustration and contempt for the current administration at an all-time high, the 69-year-old Warren — who couples a progressive vision with a populist firebrand unfazed by the prospect of going tweet-to-tweet with President Trump — may offer the "the persistence" its best chance to win the White House in 2020. The backdrop: In 2016, Warren disappointed her supporters by declining to run for president in 2016 and later refusing to endorse fellow populist Bernie Sanders during the primary. She continued to draw ire for voting to confirm Ben Carson as Secretary of Housing and Urban Development. 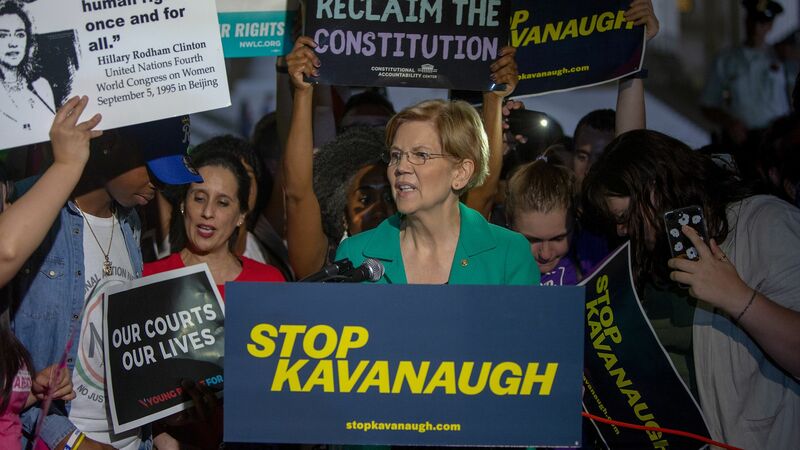 But in the months since, the "ongoing parade of horribles" offered up by the administration has caused Warren to change her tune and become a vociferous, unabashed opponent of all things Trump. Warren has since assailed a range of Trump allies that include Ben Carson, the Mercer family, and most recently Supreme Court nominee Brett Kavanaugh, whose labeling of her Consumer Financial Protection Bureau as a "threat to individual liberty" may be "the closest Trump has come to hanging raw meat in front of a hungry bear," Traister writes. What they're saying: Not all Democrats think Warren is the right pick for 2020. Some still hold it against her for not endorsing Bernie Sanders in 2016, while others believe her politics skew too far left or think she'll be depicted as "the reanimation of Hillary Clinton." But for many, Traister writes, Warren is "a brawler" and thus "the perfect person — left, female, and furious — to avenge the loss of Hillary while also bringing to the White House a politics far more progressive than Clinton ever would have."